A thorough, objective, and balanced analysis of the most prominent controversies made in the name of science — from the effectiveness of proposed medical treatments to the reality of supernatural claims. Is there any truth to alien abduction and cold fusion, recovered memories and conspiracy theories? Michael Shermer, founder of the Skeptics Society and Skeptic magazine, and his team of well-known scientists and scholars have created an open-minded and authoritative two volume set that gives evidence both for and against extraordinary theories. 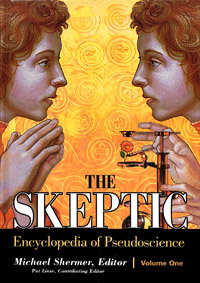 Edited by Michael Shermer, editor and publisher of Skeptic magazine, this truly unique work provides a comprehensive introduction to the most prominent pseudoscientific claims made in the name of “science.” Covering the popular, the academic, and the bizarre, the encyclopedia includes everything from alien abductions to the Bermuda Triangle, crop circles, Feng Shui, and near-death experiences. Fifty-nine brief descriptive summaries and 23 investigations from Skeptic magazine give skeptical analyses of subjects as far-ranging as acupuncture, chiropractic, and Atlantis. The encyclopedia also gives for-and-against debates on topics such as evolutionary psychology and case studies on topics like police psychics and the medical intuitive Carolyn Myss. Finally, the volumes include five classic works in the history of science and pseudoscience, including the speech William Jennings Bryan never delivered in the Scopes trial, and the first scientific and skeptical investigation of a paranormal/spiritual phenomenon by Benjamin Franklin and Antoine Lavoisier. You know, Michael, you’ll eventually need to write a book about the 9/11 Truthers and Scientology. I look forward to your thorough analysis. wow, it’s sad that shermers website attracts so many people who just dont get it. Keep up the work mike. The books are great. I just wish they were easier to get a hold of in New Zealand. Well, I gues there are some other psychic walking around. soon they will be asking for attention because they predicted that an Afroamerican woulbe president… and voila! Obama is the president. I guess if you go out everyday with an umbrella and say “it’s going to rain” I guess you will be right one day. The “Skeptic” term has essentially become equal to “nut-job” in my mind, thanks to these almost avant-garde replies on every skeptics site that I have visited. They effectively support Shermer’s “Why Smart People Believe Weird Things” theory. It seems that focused minds are very good at filling in the gaps with a host of different dreamscapes. It’s like watching someone wield a chainsaw for fun. You might want them to stop, but ultimately, there’s very little you can do about it. Now, I’m quite certain that there’s a spattering of genuine mental illness at play here as well, but to have to wade through, and even expect these rampant mutterings on such a well nuanced site really breaks my heart. @AJ: I don’t think the website attracts a high proportion of morons; rather, the morons are the ones who get angry because of the website, and angry people are far more likely to comment. Carl Sagan gave us ‘The Baloney Detection Kit’. He admited that science at times had been wrong. My most memorable Sagan quote, “Somewhere, something incredible is waiting to be known”. The back cover of Carl Sagan’s 1985 book “Contact” shows the author leaning against a building with the ‘Winged Planet’ design engraved above his left shoulder. Was this an attempt to connect his story to the Sumerian stories of the Anunnaki? He named the spaceship Gilgamesh. My recent book “The Anunnaki Were Here!” reveals the conclusive evidence proving it’s title! !